An irrevocable trust is one that generally cannot be amended, modified, or revoked. The written terms of the trust agreement—the trust's formation documents—are more or less set in stone after the trust has been created. They can't be tweaked except under some very isolated and rare circumstances. So why create a trust that's so ironclad? These trusts offer a few distinct advantages over their revocable counterparts. Why Create a Trust in the First Place? All trusts other than testamentary trusts share a common benefit: They avoid probate, the legal process required to transfer ownership of assets from a deceased individual to a living beneficiary. When you fund your trust with money or assets, you automatically provide a way for ownership of those assets to move to a person or persons of your choice so probate becomes unnecessary. This has two advantages. You can decide exactly when your beneficiary should inherit. It doesn't necessarily have to be in the weeks or months after your death. Your trust can hold onto the assets and transfer them to him at a later time. And its terms never become a matter of public record if your trust is not subject to probate. If you simply leave a will, it must be filed with the court to open probate. Anyone and everyone can simply look it up to find out what you owned and who you left everything to. You can dissolve or amend a revocable trust any time you like if you're still mentally competent, but these trusts don't protect against lawsuit liability or estate taxes the way an irrevocable trust does. By its very nature, you can reclaim the property you place into a revocable trust. The law therefore considers that you still personally own this property, so its value can be counted for purposes of qualifying for certain government benefits as well. A revocable trust automatically becomes irrevocable at your death because you're no longer available to make changes to it or revoke it. An irrevocable trust can protect your assets from creditors and judgments if you work in a profession that puts you at risk for certain lawsuits. Because you can't take the property back after you transfer ownership of it into an irrevocable trust, your creditors or a judgment holder can't reach it, either. It's not yours any longer. Your trust now owns these assets, and a creditor or judgment holder can't take property from anyone or anything that's not a party to the lawsuit or the debt in question. An irrevocable trust can be a good way to ensure that your estate assets are preserved for your beneficiaries. If you fund your irrevocable trust while a lawsuit is pending against you, or even if an event has occurred for which you might be sued, a court can determine that you did so in order to keep the property and funds out of the hands of a judgment holder. Your trust arrangement could be overturned if it can be proved that you created it in "contemplation" of an event. Property that you've transferred into an irrevocable living trust does not contribute to the value of your estate for estate tax purposes. Just as your creditors and judgment holders can't reach it, neither can the Internal Revenue Service tax your estate on its value. This can be beneficial if you have a very large estate. As of 2018, estates valued at more than $11.18 million are subject to a federal estate tax on the balance of their values over this threshold. The top tax rate is 40 percent. This threshold, called an exemption, is indexed for inflation so it goes up annually. But it might not always be this significant. The exemption increased from $5.49 million in 2017 to its current amount under the terms of the Tax Cuts and Jobs Act (TCJA) that went into effect in 2018, and the TCJA isn't necessarily permanent. It sunsets or expires at the end of 2025, and the exemption can be expected to plummet back into the $5 million to $6 million range at that time if Congress doesn't renew the legislation. Assets that you or a beneficiary own can count against you for purposes of qualifying for certain government benefits, including Medicare, Medicaid, and Supplemental Security Income. Transferring assets out of your ownership can avoid the necessity of depleting your property to qualify for assistance in paying for nursing home care. You've already given the property away when you funded your trust. As long as you don't need long-term care within five years of the transfer, that property does not count against you for purposes of qualifying for assistance. An irrevocable trust can also protect assets for special-needs beneficiaries when it's designed in such a way as to avoid disqualifying her for crucial government benefits, which can be the case if she inherits assets outright. Irrevocable trusts come in two basic forms: living trusts and testamentary trusts. A living trust, also called an "inter vivos" trust is created and funded by an individual during his lifetime. Testamentary trusts are always irrevocable because they're not created and funded until after their creators' deaths. These trusts are established according to terms contained in the deceased's last will and testament. No one with the legal authority or ability to change the terms of a testamentary trust is still living by the time it goes into effect, so that automatically makes it irrevocable. 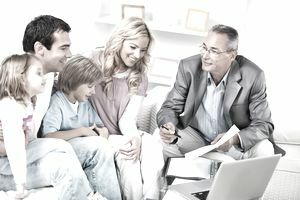 An irrevocable life insurance trusts (ILIT) is a type of living trust that can be set up to accept the death benefits at the time of your death to avoid having their value included in your estate for estate tax purposes. This can be an important consideration if the TCJA expires and the estate tax exemption plummets after 2025. You can fund an ILIT with up to $15,000 per year as of 2019 without incurring a gift tax. The cash allows the trust to purchase the policy so you never own it for estate tax purposes, and you can continue to transfer money to your trust annually so it can pay ongoing premiums. If you own the policy then transfer it to your trust, the funds would still be subject to the estate tax unless you outlive the transfer by at least three years. Irrevocable trusts also include charitable trusts such as charitable remainder trusts and charitable lead trusts. These trusts can either pay your beneficiaries first then distribute the balance of your assets to a charity, or you can set it up to work the other way around, paying the charity first. In either case, this often provides a current year itemized income tax deduction for charitable giving. One problem with an irrevocable trust is that life will go on after you create and fund it. Events might occur that can defeat your purpose. Most states have legal options in place to allow your beneficiaries to undo the trust under certain circumstances that you could not have foreseen. This typically requires the unanimous consent of all your beneficiaries, and it might not be possible if any of them are minors. They can also ask a court to "decant" the trust, which involves creating a new trust with more up-to-date terms and moving the first trust's property into that one. You can also write the trust's formation documents to allow your appointed trustee the power and flexibility to address unforeseen circumstances. NOTE: Always consult with an attorney for the most up-to-date estate-planning advice. The information contained in this article is not intended as legal advice and it is not a substitute for legal advice.